On our way to Battambang we stopped in a small town to stretch our legs. Always up for a little market exploration we walked along the dusty road looking at all the different shops. 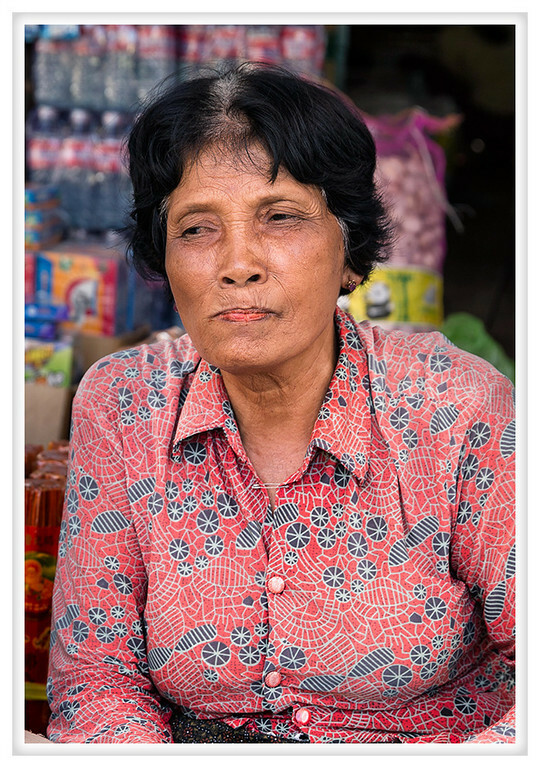 We stopped with Mr. Mony to chat with this fine lady who red-stained lips, teeth, and gums indicate that she chews betel nuts. With Mr. Mony translating we were told that the dried pieces of sliced nut are wrapped in betel leaves and flavored before chewing. Apparently they use a mixture of "snail slime" and boiled cow manure as the basis for the flavoring. It ends up looking like a white liquid not entirely dissimilar to whiteout. I didn't smell it to see if the aroma is at all similar because the list of ingredients was deterrent enough. Smoking cigarettes was traditionally a vice left to men and the betel nut the choice of women. Today I understand that it is considered old fashioned but it still provides a stimulant effect coupled with a peppery taste. It certainly isn't as offensive to the people around you as smoking so to my way of thinking it is a preferable vice.